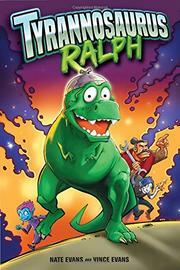 A bullying victim saves Earth after his brain is transferred into the body of a T. Rex. Stomped flat by a huge green foot in the wake of a humiliating encounter with aptly named white classmate Melvin Goonowitz, Ralph, a nerdy boy with light-brown skin, wakes to discover that thanks to local handyman/superscientist Professor Overdrive, he’s not dead but inhabiting a toothy, if tiny-armed, dinosaur brought from the distant past. Why? Because Earth is commanded to send a champion to join 10,000 other gladiators in the interstellar Coliseum of Crunch to fight one another for the continued existence of their planets. Next to the wildly diverse array of glowering, garishly hued, mightily thewed aliens filling the graphic panels, Ralph looks like Barney’s little green brother—but with pluck and luck he not only bumbles his way to an epic win, he rescues a blue-skinned new friend from a sexual predator. Back to Earth in triumph he goes to scare Goonowitz into peeing his pants, then switch into a boy again (in a cloned bod courtesy of Professor Overdrive) with an ongoing new mission to protect little guys from getting picked on. A note about real gladiators of the ancient Roman sort is tacked on at the end.